We met many others who were just like us. They were trying to put on their overcoats with arms made of smoke. The high heavens were full of little shrunken deaf ears instead of stars. 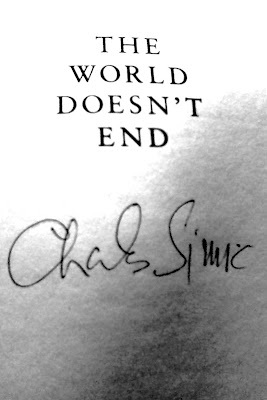 Thus begins "The World Doesn't End," a collection of prose poems that earned the writer, Charles Simic, the 1990 Pulitzer Prize for poetry. Simic was born in 1938 in the now-non-existent country of Yugoslavia. He started writing in the 1970s and eventually formed his style--one that is simple in language, but grotesque like cracked fairy tales. His work has been described as "tightly constructed Chinese puzzle boxes," but I admire his ability to address thousands of topics in short poems titled "Factory," "Ghosts," "It was the epoch" and "O witches, O poverty." Though he is a professor at the University of New Hampshire, he traveled through the geometric patterns of corn and beans of Indiana to speak at Purdue a few weeks ago. Having snagged a few literary awards this year, I was able to dine among Simic at an honorary banquet, where one of his poems was read. Women who are all sweetness. Birds singing of fair weather as they crap. 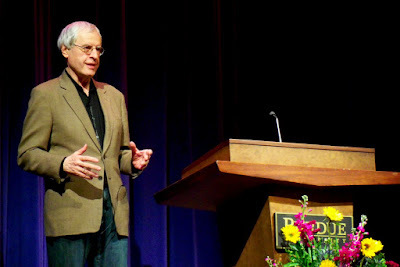 After the meal, Simic spoke at the Stewart Center. 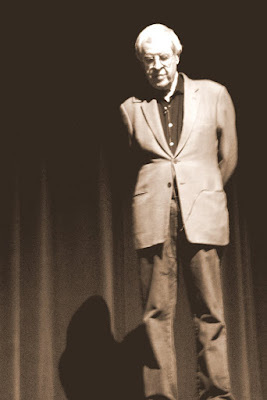 Within an hour, he mentioned World War II, guessed the number of mirrors in New York City, gave advice, made jokes about being a Poet Laureate, talked about potato chips and Genghis Khan and read some of his poems. 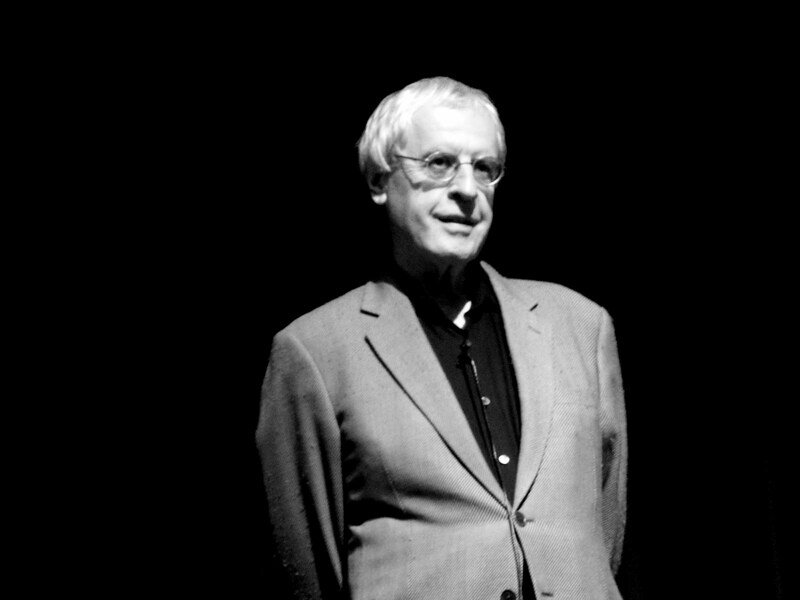 As he spoke about being the Poet Laureate in 2007, Simic's husky, accented voice enunciated "t's." "I didn't write for a year. I had thousand of emails about poetry. Everyone talks about it ... At the end of the day ... who wants to write a poem?" There were slight pauses between his sentences; more than enough for a breath of air, but not long enough to be awkward. His vowels were tall, and his posture was similarly erect, even for a man in his seventies. His hands were wrinkled, thinned. He stood at the podium in his suit jacket, leaning on it and picking at the skin around his fingernail. "You know how you find titles that are interesting? You go to the library, and there is a book called ... so-and-so. You find the title so enticing ... cancel all appointments. Then, half an hour in, you realize ... this is the most worthless book ..."
Among his jokes, he offered advice to students, who patiently waited to question him. "Do you have any advice as to how to write?" Simic smiled. "Just go ... just write any thought. Consciousness is not conducive to writing." Simic was hauntingly enticing, and his vocabulary was descriptive and poetic. "What is beautiful is easily lost," he said. "Sometimes it takes years to know what is wrong about your writing." He closed his speech with one last poem; my favorite. One night I went to keep the clock company. As if it were uncommonly afraid. In any case, I told him I understood. In every kitchen in America. Now the factory’s windows are all broken. The old men on night shift are in Charon’s boat. Just thinking about it, I forgot to wind the clock. We woke up in the dark. How quiet the city is, I said. Like the clocks of the dead, my wife replied. The best part? The autographed Pulitzer Prize-winning collection.